The trick to staying alive in avalanche terrain is to stay away from dangerous conditions. Here are Bruce Tremper's "10 Commandments of Low-Risk Travel". The trick to staying alive in avalanche terrain is to stay away from dangerous conditions. Here are Bruce Tremper's "10 Commandments of Low-Risk Travel". The following is excerpted from the new Staying Alive in Avalanche Terrain, 3rd Edition and has been edited for space. As I often say, it’s our habits that save our lives (in avalanche terrain). This section covers low-risk travel habits that, through the years, avalanche professionals have developed through trial and, sometimes tragic, error. Make no mistake. These techniques do not guarantee safety; they just help push the safety arrow a few notches closer to the 100 percent mark. We will all make a wrong decision at least once in our lives, and more likely, several times. So when the inevitable happens, practicing low-risk travel habits is the only way to push the safety arrow from 99 percent to 99.9 percent. The final part of the risk equation—vulnerability—can be mitigated with proper safety equipment and good rescue skills, pushing the arrow up to 99.99 percent, which is the minimum safety margin for a long career. Unlike the tablets of Moses, these commandments are not etched in stone: every time I publish them I add and subtract items. If something does go wrong, there always needs to be someone left in a safe spot to be able to dig the other(s) out. Groups of people weigh more than a single person and are more likely to overload buried weak layers. Several people wandering all over the slope are much more likely to find the trigger point of an avalanche than a single person. With small groups, expose only one person at a time to the hazard. Some ski patrols consider crossing above your partner tantamount to attempted homicide, and they deal with the infraction accordingly. If you trigger an avalanche on top of your partner or on another party below, not only is it very thoughtless behavior, it’s also likely that everyone will get killed because no one is left to carry out a rescue. For the same reason, when you rejoin your partners, you always stop below them instead of above them. If you trigger an avalanche when you’re just standing in the middle of the avalanche path (or on a stationary snowmobile), you have almost no chance to escape off the moving slab. 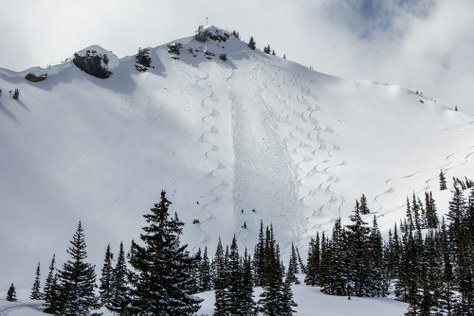 That is why for years, ski patrollers and helicopter-ski guides have used what they call ski cuts as an effective technique to reduce the chances of getting caught. I like to use the more inclusive term slope cuts, because snowboarders and snowmobilers can do them as well. The idea is that if you trigger an avalanche, you want to do it with your speed built up while heading for an island of safety, so that, in theory, if the slope does fracture, your momentum will carry you off the moving slab. If the first person just dives into an avalanche starting zone and an avalanche breaks, that person’s options are very limited. Therefore, the first person across the slope should always practice slope cuts. If you trigger an avalanche, you want to be as high as possible on the slab. Snow below you can’t bury you, but the snow above can. I’m being hyperbolic here for the effect. Someone always has to go first, and sometimes it’s going to be you, in which case you practice your slope cuts and all the other commandments. But I honestly try to avoid going first if I can. Avoid testing the stability of a slope. If you can’t find any volunteers, use an involuntary stability tester—a cornice, for example. Just tumble a refrigerator-sized-or-larger chunk of cornice down the slope first (see chapter 6, Stability, for more details). Terrain almost always gives you small gifts - small test slopes - that you can jump on to see how they respond. Never pass up a test slope. It's better to find out the stability of the snowpack on small slopes that won't kill you before you get to the big ones that will. Only a fool jumps into a big slope without first gathering lots of data from other safer places. This is a standard technique at ski areas, helicopter-skiing operations, and extreme video shoots - start on gentler, safer slopes and work slowly into more dangerous terrain to reduce uncertainty to reasonable levels. What will happen if it slides? What’s below? What’s above? What is the slope connected to? If you don’t like the consequences and you’re uncomfortable with the uncertainty in the snowpack, maybe you should find another option. It’s ironic that here in the information age, communication remains the central problem of our lives. Have you ever noticed that talking honestly with one another would eliminate the vast majority of television and movie plots? It would also prevent most wars. I also find it ironic that at the same time we don’t communicate enough, we suffer from information overload, which makes us numb, dumb, and distracted. Many avalanche accidents occur because someone took the easy choice . You can keep easy choice mistakes to a minimum by simply slowing down, especially at critical decision points. I tend to travel with very fit people in the backcountry, and it seems that when we find ourselves getting into dodgy situations, it’s because we’re just going too fast. Joe Gnarly training for the SkiMo circuit is out front breaking trail, making routefinding decisions without consulting the rest of the group, and even when he stops, as soon as the last person catches up, he takes off again before any discussion occurs (guides call this tendency the accordion). Instead, stop often and discuss the plan. Always look for some excuse to stop at critical decision points to let folks catch their breath; grab a snack and fluids; and most important, practice the Eighth Commandment—communicate. This is where we deal with the vulnerability part of the risk equation—where, for whatever reason, your decisions about hazard and exposure didn’t work out so well, and you got caught anyway. How do you minimize the damage? Highway avalanche programs can put people on buses or trains (that are harder to bury or knock off the road) to reduce their vulnerability, and the larger vehicles offer better protection than cars. For backcountry travelers, carrying rescue equipment, and knowing how to use it, can offer some level of reduced vulnerability. 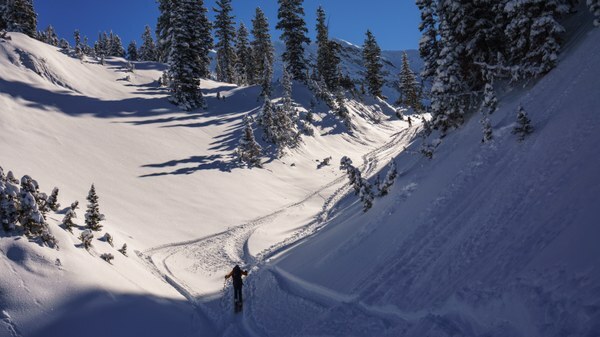 Read more in Staying Alive in Avalanche Terrain, 3rd Ed., by Bruce Tremper. Photos by Bruce Tremper.